The document is “Historical Gazetteer and Biographical Memorial of Cattaraugus Co. NY, ed by William Adams, pub 1893. History of the Town of Machias – Chapter XXXV (35), Page 798. A link to a transcript of biographies found in this history book is located at the website named “Three Rivers”. I have been unable to locate an original copy of the biography in question, but will post it here if I locate it in the future. Madam LEE-O-NETTO, M.D. was born in Sherbrooke, Canada, while her parents, who were native Senecas, were there on a visit. She was raised near Salamanca and educated in Lenoxville and other schools, and took a medical course in Nelson Greene Medical College, where she was graduated about 1868. She practiced five years with Dr. BROWN, a celebrated surgeon and physician of Sherbrooke, Canada. Her father, KANISTANAUX, was also a physician. Her grandfather, NATALAC, was a chief of the Banikeen tribe. 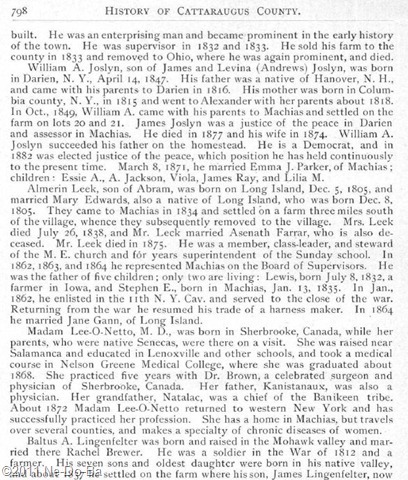 About 1872 Madam LEE-O-NETTO returned to western New York and has successfully practiced her profession. She has a home in Machias, but travels over several counties, and makes a specialty of chronic diseases of women. How fortunate to find another document with addition family information. However, since these biographies were submitted by the families rather than independently researched and written, I have to think of this as yet another form of local advertising and likely to contain a lot of hype. The most exciting thing from my standpoint is the mention of her grandfather as “Natalic” of the “Banikeen” tribe. Metallic and Natalic are the same sound. The Abenaki from Quebec pronounce their tribal name as “a-ben-a-key” which is the same sound as “ban-i-keen”. Although I consider this as hype on one hand, on the other, I can not discount the name, locations, and tribe. It seems too great a coincidence that someone in New York State just happened to make up these names & places and they turn out to be a real. But, of course, she could of heard these names from someone else and appropriated them for herself because it made a good story. Native People learned very early that white folks love a good “Indian” story and they are not concerned at all about reality. Our Metallic stories often refer to him as a chief, but I have never found anything to substantiate the title. It always sounds better when the “Indian” in your story is a chief or princess! I have little doubt this “chief” title was included simply to boost audience appeal. This biography provides me with the names of two specific locations in Canada for her origins, Sherbrooke and Lenoxville. This fits very well with what I know about Metallic’s daughter. Paramachenee is said to have married an Eli Moulton who lived in Sherbrooke. Lenoxville is very near to Sherbrooke. I am concerned the woman mentioned in this biography may be too old to be the same woman mentioned as sister to Henry Kanistanaux. So it seems I could have two different woman using the same name and both may be doctors. Obviously, I need to do a lot of searching on the term Lee-O-Netto and the dozens of possible variations. How Does She Fit In the Family? If she graduated from college (which I doubt!) in 1868, than she must have been at least 18 so born about 1850 or earlier. Layton & Marleah were born about 1833, which would make them about 17 in 1850. It is possible they are her parents. However, I am inclined to think Eli Moulton was her father. But Eli is not mentioned as a doctor in the 1875 census. You might suggest he was too old to practice medicine, but I discount that. If he still had his mind, he could still diagnose and administer medicine. He was not too old to be a hunter and surely being a doctor would be a much easier occupation for a 90 year old! I think I will wait to find Dr. Lee (or the two of them) in other records before I decide how she (or they) fit into the family. I don’t think I buy her story about her parents being Seneca visiting in Sherbrooke, but there may be clues here to follow. It does suggest I should poke around in Seneca records (if I can find any this early!) to see if any names stand out. If Dr. Lee is who she claims (the granddaughter of Metallic) than her mother would be Abenaki (although I don’t know anything about the origins of Metallic’s wives, so perhaps only 1/2 Abenaki) and her father, Eli, would be Anglo. Perhaps the Moulton’s moved from Sherbrooke into a Seneca community at some point. If so, this might suggest Metallic’s wife and the grandmother of Dr. Lee had Iroquois origins. I will explore this possibility in more detail in a future post. I don’t think I buy her story about growing up in Salamaca, NY and being educated in Lennoxville. One is in western New York and the other is near Sherbrooke in Quebec. Quite a commute! I checked the 1871 census looking for a Dr. Brown in the Sherbrooke region, but found nothing promising. Unfortunately, the name is too common to just Google it. I could find no mention of a college anywhere in North America with a name similar to “Nelson Greene Medical College”. Of course it still may exist, but it certainly was not well known and no longer exists today. When I Googled just “Nelson Greene” I received some interesting results. A man named Nelson Greene wrote a history of the Mohawk Valley, published in 1925 and another for the Hudson River Valley. His books are local history for the region of New York where we find the Kanistanaux family. Perhaps Dr. Lee had met Mr. Green while each were traveling around New York, he researching history and she as a healer. They could have stayed at the same hotel, shared a coach ride, she could have read a news article about him, or a number of other possibilities. Perhaps this is a case of “Indian” humor? She studied with Dr. BROWN (suggesting a skin color rather than a real person) at the Nelson Greene Medical College (perhaps she knew Mr. Nelson Greene was self-taught or received his information from oral tradition like herself). If you would like to see this research project succeed, please consider a financial donation using the PayPal button at the top in the right side panel. All donations will go towards acquiring additional documentation. I make use of the genealogyfreelancers service to get the most bang for the buck. So far I have been very successful, because I usually know exactly what I want and where it will be found. If any of my readers have access to the county history book discussed here, I would be very grateful for a copy of the actual page. If any reader has ever heard of “Nelson Greene Medical College” please share what you know.